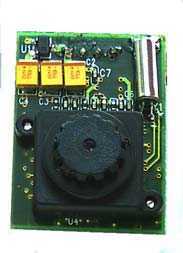 CMOS camera with JPEG compression module performs as a video camera or a JPEG compressed still camera and can be attached to GSM module or PDA via RS232. Users can send out a snapshot command in order to capture a full resolution single-frame still picture. The picture is then compressed by the JPEG engine and transferred to the host by serial link (UART on CMOS 3,3 V level). 115.2Kbps for transferring JPEG still pictures or 160x128 preview @8bpp with 0.75fps. Built-in JPEG CODEC for different resolutions. Built-in color conversion circuits for 2-bit grey, 4-bit grey, 8-bit gray, 12-bit RGB, 16-bit RGB or standard JPEG preview images.